Luxury villa; swimming pool with multi-colour underwater lighting, hot tub, games room. Set within a fantastic resort with gym, spa, crazy golf and playground. 15 minutes to Disney, 25 to Sea World. Our home is a Meditteranean style villa decorated and furnished to a very high standard for your comfort and enjoyment and constantly updated. Located on Disney's doorstep it has a private pool, separate HOT TUB and is a fully air conditioned executive property (with a large wow factor) that can comfortably accommodate eight people. The Ground Floor has been tiled throughout, there is a a large LOUNGE AREA complete with 2 comfortable sofas, an armchair and footrest and 2 rocking chairs , DVD player, large LCD TV with cable channels including European football and Disney channel, portable telephone and answerphone + FREE HI SPEED WIRELESS INTERNET. A fully equipped OPEN PLAN KITCHEN with a breakfast bar and all the appliances needed for a modern kitchen including a dishwasher, cooker, large microwave, and a refrigerator with built in icemaker. There is a seperate LAUNDRY ROOM with a washing machine , a seperate dryer , ironing board and iron . You also have a cloakroom that leads to the pool. The POOL AREA :The pool can be accessed from the cloakroom or the patio doors in the living area both of which are alarmed for the safety of your children.The pool is square in shape and is 26'x13' in size with multicolour underwater lighting and a patio which has a full set of LUXURY patio/pool furniture including sun loungers,recliners with foot rests as well as four chairs, the deck is fully screened to let the sun in but keep insects out (recently replanted with beautiful flowers for privacy ). Our pool can be heated on request for a fee. The First Floor : There are four large beautiful bedrooms consisting of 1 master bedroom with a king-size bed, a 37" LCD TV complete with cable channels, clock-radio, and an en-suite bathroom with a Roman bath, walk in shower and his and her washbasins. A second double room with 32" LCD TV - cable channels and clock-radio. Two further rooms containing twin beds, 32" AND 21" LCD TVs , PLAYSTATION 2 AND XBOX 360. All the bedrooms have built in wardrobes containing an abundance of hangers. There is also another fully equiped bathroom with shower and bath. ALL linens and towels are provided for the bedrooms, bathrooms and pool. The villa is located on the Gated resort of High Grove. There is a staffed community CLUBHOUSE WITH COMPUTERS, LARGE PLASMA SCREEN ROOM ,GYM, POOL , SPA, CRAZY GOLF and CHILDRENS PLAY AREA which is all available FREE to our guests. 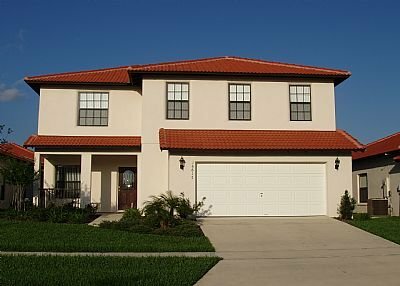 High Grove is situated where Highway 192 meets Highway 27 (Kissimmee /Clermont ) You are apprximately 6 MILES from Disney World, Hollywood Studios, Animal Kingdom, Epcot and Disney water parks. Disney Springs as a short journey for daytime fun and nightlife. You are close to all the other major attractions Orlando has to offer. Highway 192 offers 15 miles of shops, supermarkets, excellent restaurants, fast food outlets, bars, shows, crazy golf, go-carts, water parks and helicopter rides. There is also a 24 hour Super Walmart supermarket less than half a amile from High Grove. Other Attractions : Universal Studios , Islands of Adventure , Seaworld , Discovery Cove (your chance to swim with a Dolphin) , Busch Gardens , Kennedy Space Centre , Cypress Gardens , Silver Springs , Gatorland , The International Drive Area , Aquatic Wonder Boat Tours , Airboat rides , Parasailing , Balloon Trips , Petting Farm (your chance to milk a cow) , Golf (over 150 courses within an hours drive) , Fishing , water sports , Horse riding , and motor sports. You are also 1 hours drive from the Atlantic coast and 1 hour and 20 minutes from the Gulf coast. Nightlife : Pleasure Island (where every night is new years eve in the many bars , restaurants and clubs ) Disney Springs with Cirque du Soleil , a 24 screen cinema, Planet Hollywood , and Disney Quest. Dinner Shows :Arabian Nights, Pirates Dinner Adventure , Medieval Times , and Sleuths Mystery Dinner Shows.